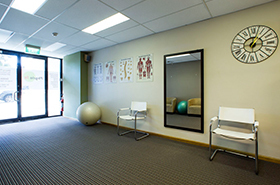 Physio fx provides a diverse range of individual and complementary treatments designed to relieve pain or discomfort, ease tension and restore full – or at least maximise available – functionality of limbs, muscles and joints, enabling patients to get on with their lives as normally as possible, free from pain. Why accept four weeks of back or neck pain when early intervention can shorten, or accelerate the recovery time? This is the most common type of pain suffered by the majority of people at some time, left untreated back and neck injuries typically take for weeks to improve and have a greater chance of turning from an acute to a chronic condition. Physiotherapy will help your body heal faster and reduce the risk of the condition worsening. 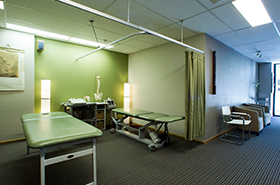 Physio fx uses state-of-the-art equipment combined with modern physiotherapy practices in the treatment of simple strains and sprains (e.g. tennis elbow, ankle sprain, knee joint strain) and intensive post-operative rehabilitation after surgery for conditions such as rotator cuff repair and anterior cruciate ligament reconstruction. Pain or discomfort associated with acute arthritis flare-ups is managed using various electro-physical therapeutic modalities, including – therapeutic ultrasound, shortwave diathermy and interferential therapy. Physio fx provides a comprehensive multi-discipline post-operation rehabilitation program helping patients recover full function after hip & knee replacements, ACL reconstruction, rotator cuff repair and similar surgeries. A treatment combining postural drainage and breathing exercises to improve the cardiorespiratory condition of patients with lung pathologies, including the elderly and young children, patients undergoing prolonged bed-rest and those in a post-operative status. Vertigo is second only to back pain as a common complaint, particularly among the elderly, and has a variety of interlinked causes; one of these is vestibular disorder. Physio fx Vestibular Rehabilitation is an exercise based treatment program promoting central nervous system compensation for inner ear deficiencies. The exercises aim to minimise dizziness, improve balance and prevent falls by restoring normal functioning of the vestibular system. Craniosacral Therapy applies gentle pressure to the skull, bones, spine, diaphragm and other areas, providing relief from pain caused by body misalignment and stress among other things. This therapy promotes a sense of wellbeing for both mind and body by stimulating the release of any negative emotions and tension, known as a ‘SomatoEmotional Release’, which may have been contributory factors in the pain or discomfort experienced. anxiety or other emotional shock and that can manifest itself as pain in the form of a headache, knotted stomach, tension etc. VMT can improve mobility of internal organs and restoration of physical and emotional health. Relief of tight muscles through the insertion of an extremely fine, single use, sterile solid needle directly into the affected muscle causing a change in the neuromuscular control and easing tightness. Dry needling is effective in treating muscles in spasm and studies indicate the technique’s usefulness as a secondary treatment for alleviating lower back pain. A modern Western technique, dry needling should not be confused with traditional Chinese acupuncture. The Physio fx prenatal programme teaches parents-to-be some skills for managing and coping with the physical and emotional demands of pregnancy, labour and childbirth. The programme can be downloaded from the internet.